Trumpeter Mike Galisatus is the Director of Bands at the College of San Mateo. and has been the recipient of various teaching honors including the Peninsula Arts Council Arts Educator of the Year for 2007, the Otter Distributors 2004 Jazz Educator Award for the state of California, and the Gil Freitas Memorial Award for music education. He is in demand as an adjudicator and guest conductor throughout California, and currently holds the office of President of the Bay Section of the California Association for Music Education. 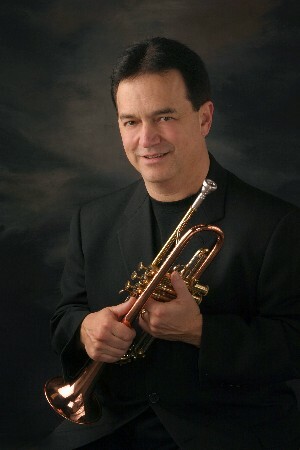 As a freelance trumpeter in the San Francisco Bay Area, Michael has recorded with Pete Escovedo and Queen Ida, and has performed with a variety of artists, including Frankie Valli, Kenny Loggins, Gladys Knight, Natalie Cole, Louis Bellson, Johnny Mathis, Mel Torme, The Temptations, The Four Tops, Heat Wave, The O’Jays, and a host of others.